is it okay to put the sarracenia in a tray of water? I heard that putting nepenthes in a tray of water will rot the roots. Sarracenia and nepenthes are kinda the same, so can i put my sarracenia in a tray of water? Re: is it okay to put the sarracenia in a tray of water? Actually Sarracenia love living in a tray full of water. yep keep mine in kitty litter trays all year round ,they are cheap and easily replaced if you are growing out side that is inside in a tank may be differnt !! Nepenthes don't like standing water, no. Many of them are epiphytic which means they grow on the bark of trees so all the water they get is rain water running down the tree when it rains. Others grow in the ground (many in rockier areas) and are used to heavy rainfall followed by hot humid conditions. Sarrs aren't like this. They can live like a nepenthes, but in nature they usually live in wetter conditions most of the year. I have some sarrs in 6 inch deep pots and keep them in about 3 inches of water outside year round, and they thrive. This photo might help put it in perspective. 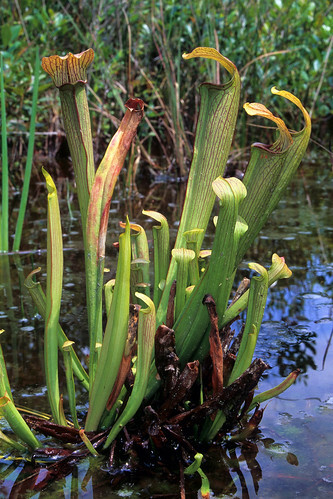 These sarracenia are happier than pigs in slop. can my nepenthes been put in a water tray? How do you water your tall pot, tray or not ?